Life is movement; the universe knows no stillness. From atoms to galaxies, everything quivers, throbs, moves, unfolds, coils up, ripples, expands, radiates, multiplies, eludes, huddles up, branches off, augments, and dwindles. All is part of the huge cosmic dance where the only constant is change. Even straight lines can relate to motion, provided they are not horizontal, which indicates absolute rest. Verticals help the eye to ascend or descend, whereas diagonals are like arrows or very active vectors. Agitation reaches its utmost with zigzag lines that furrow the canvas like flashes of lightening in a storm before a clap of thunder, or with diverging diagonals that resemble the radiant rays of the sun. Even though I appreciate the fire within ice of static organizations, I am always more seduced by the delicate equilibrium one strives to achieve through the dynamic confrontation of unstable forces reaching the breaking point. Movement is not easy, since to capture it is to stop it. In 1943, I had the opportunity to meet Marguerite Bougai, a dancer and teacher of the modern choreography developed by Isadora Duncan and Martha Graham. I had no pretension of becoming a ballerina, but I was interested in pursuing the origin and essence of motion, in part by personal corporal experience and mostly by sketching Marguerite and her students during rehearsal. Having a good mimetic instinct for kinetic sequences, I enriched my memory with choreographic syntax and vocabulary that was to broadly enhance my comprehension of movement and dance. In 1952, I designed several costumes for Marguerite Bougai and in 1953 the stage sets and all the costumes for a ballet Herakles created by Jeanine Charrat and her company at the Théâtre des Champs-Elysées in Paris. 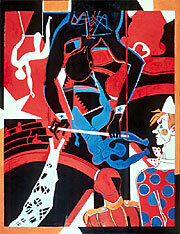 I undertook large compositions on the theme of the circus, spectacles and sport during the 1970s. Because of the bright sunlight of California, where I spent a good part of the time each year, I avoided impasto that casts unpleasant shadows and used hard edged surfaces of bright colors enhanced by arabesques for the organic parts. The major glamour of the circus is to illustrate perpetual motion, from the blare of the brass orchestra, the tumbles of the clowns, the somersaults from trapeze to trapeze, the precarious pyramids of contortionists, the leaps of lions and tigers obeying their tamers whip, the graceful evolution of horses carrying their acrobatic riders, to the spectators hands applauding frantically at the end of a particularly successful number. It is all this glowing racket that I wanted to depict with subjectively blown-up or diminished proportions, as if following the perceptions of the spectators as their attention is drawn from one thing to another. During the 1980s, my purpose was to depict womens bodies in action. I thought that nothing was more out of date than stereotyped nudes on sofas. 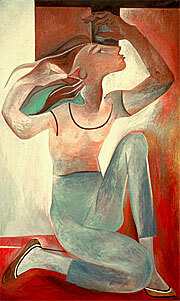 Mostly titillating for male painters and male viewers. What could be more attractive than swimmers bodies whose muscles were hidden or revealed by the surf or the waves? Everything moves and falls back, everything is cast apart to be transformed and interact later in the formation of new ensembles. I always believed that if I wanted to reflect or consider, I had to do it before or after work. When holding a brush or a pencil, I had to find the speed of a rapacious bird swooping down upon its prey. Painting is an action where target and arrow must meet with deadly accuracy, which leaves no room for doubt or wavering. If not entirely self-confident, one can make more sketches or studies, but these necessary exercises must be all but swept aside when surges the undaunted energy of the creative trance. In the intensity of action there is no time for inhibition or critical thoughts. Only after the days work is over is it right to sit down and look coldly at the work in progress and to weigh what mathematical considerations or balance may add to sheer intuition. Personally, I always allow my reason to serve my folly rather than the opposite. After so many years of rectangular canvases, Gilot began to look for some relief from that format. In the 1980's she tried both round and oval canvases, paralleling an interest in mystic diagrams based upon the writing of Carl Jung regarding mandala symbolism and the desire to create with a continuum. 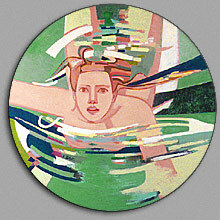 Wishing to present women in an active mode, coupled with her lifelong joy of swimming, Gilot chose a circular format for this portrait. This is among Gilots earliest non-representational works. The structure of this small painting, with its rhythms of flat, simplified forms suggesting the anatomical tensions of a reclining figure and unencumbered by expected tonal associations, already contains the seeds of the form and color explorations found in her later canvases. This canvas communicates the excitement and quickened pace of the acrobats performance through its active composition and unexpected coloration. Vibrant reds and blues sharply contrasted with orange, black and white. Of her colors, Gilot is interested in the element of danger, of putting together complementary colors that should normally clash. In these paintings, which explore the analogy between artist and acrobat, Gilot makes her own contribution to a recurring theme in twentieth-century art.